Ikegami is a leading manufacturer of specialized cameras, image processing and transmission equipment. Ikegami was founded in 1946 in Tokyo, Japan. Today around 800 employees are working in 3 factories and 9 sales and service organizations all over the world. Ikegami has consistently created the most advanced products in all image processes, namely image, transmission, processing, recording and display. 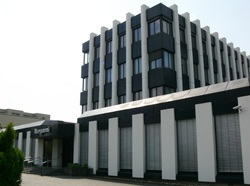 Ikegami Electronics (Europe) GmbH in Neuss, Germany, was founded in 1970 and it is the sales and service organization for Europe and Africa. There is a branch in the UK. In the other European, Middle East and African countries Ikegami is working together with authorized distributors and dealers. Major Products: Broadcast use TV camera systems, Broadcast colour monitors, Broadcast video production and processing systems, Outside Broadcast Vans,Security Surveillance TV camera systems, Medical Electronic camera systems, Vision Inspection Equipment and systems.